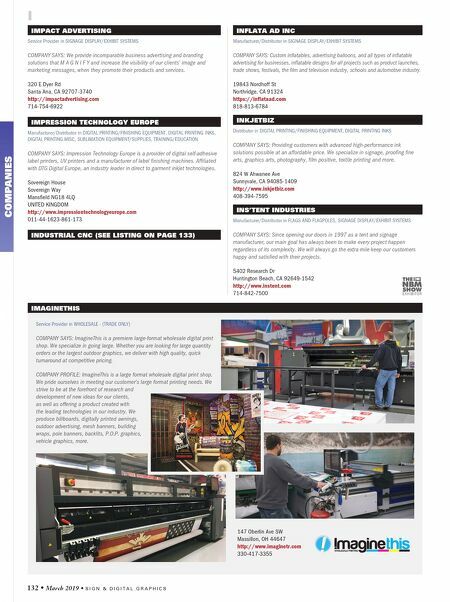 S I G N & D I G I T A L G R A P H I C S • March 2019 • 133 INX DIGITAL Manufacturer in DIGITAL PRINTING INKS COMPANY SAYS: INX Digital is a global manufacturer of solvent, eco-solvent, bio, water, oil, and UV-curable digital inks. Known for our TRIANGLE line, our inks are optimized for HP, Nur, VUTEk, Scitex, Oce, Mutoh, DGI, Seiko, Mimaki, Roland and Epson printers. 150 N. Martingale Ste 700 Schamburg, IL 60173-2009 http://www.inxinternational.com/triangle 510-895-8001 ISIGNS INC Distributor in ARCHITECTURAL & STOCK SIGNS, BANNER MATERIAL & SUPPLIES, ELECTRONIC SIGNAGE (LED/NEON), SIGN COMPONENTS/HARDWARE, SIGNAGE DISPLAY/EXHIBIT SYSTEMS, WHOLESALE - (TRADE ONLY) COMPANY SAYS: iSIGNS Inc. is a national wholesale sign distributor specializing in energy-saving compact LED signs with any message. Our Direct-View and LED backlit signs can be customized to meet your customers' size, shape, color, message and mounting needs. 7625 Birkmire Dr Fairview, PA 16415-2933 http://www.isignsled.com 866-437-3040 INTEGRITY SIGN SOLUTIONS INC Manufacturer in ARCHITECTURAL & STOCK SIGNS, CHANNEL LETTER SYSTEMS, LASER ENGRAVERS, SIGN COMPONENTS/HARDWARE, WHOLESALE - (TRADE ONLY) COMPANY SAYS: Integrity Sign Solutions, your complete wholesale solution partner. 4302 Security Pkwy New Albany, IN 47150-9374 http://www.integritysign.com 866-280-7446 • 502-233-8755 INVENTORY SALES CO Distributor in SIGN & WRAP SHOP TOOLS/SUPPLIES, SIGN COMPONENTS/HARDWARE, SIGNAGE DISPLAY/EXHIBIT SYSTEMS COMPANY SAYS: Inventory Sales Company, your premiere source for manufacturing. Founded in 1972 by Jim Friedmann, Inventory Sales Company strives to be your company's trusted and dependable Midwest distributor. 9777 Reavis Rd St Louis, MO 63123 http://www.inventorysales.com 800-272-7883 • 314-776-6200 I INDUSTRIAL CNC Manufacturer in CHANNEL LETTER SYSTEMS, CNC ROUTERS (XYZ), DIGITAL PRINTING/FINISHING EQUIPMENT, FABRICATION & INSTALLATION EQUIPMENT, SOFTWARE COMPANY SAYS: CNC routers for sign makers. Create 3D, dimensional signs and V-carved letters, wood carving, aluminum cutting, acrylics, stencils and more. The best CNC router for professional sign makers. Easy. Affordable. Industrial. Visit www.signmakingcnc.com. 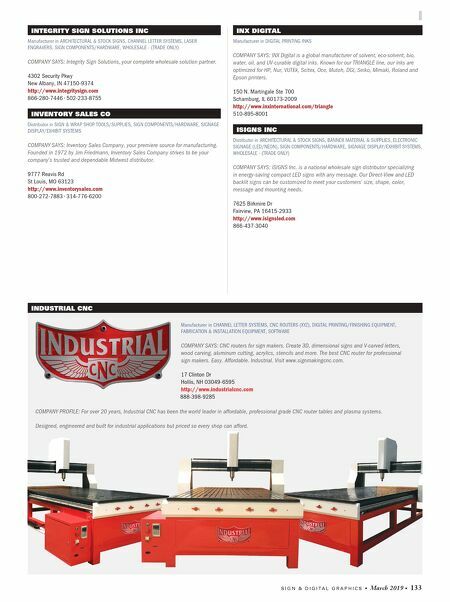 17 Clinton Dr Hollis, NH 03049-6595 http://www.industrialcnc.com 888-398-9285 COMPANY PROFILE: For over 20 years, Industrial CNC has been the world leader in affordable, professional grade CNC router tables and plasma systems. Designed, engineered and built for industrial applications but priced so every shop can afford.